If you are looking for an outstanding new venue that will make your wedding stand out … check out this astonishing resort in Paso Robles. 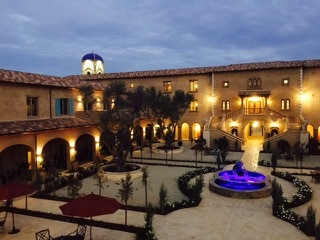 There is great travel praise for the beautiful new Allegretto Resort in Paso Robles and you will certainly be impressed by the stunning 171-room Tuscan-inspired design. Everywhere you look the grand open spaces make you want to take some time and explore the place. But peel back just one little layer of this resplendent onion and the depths of something more powerfully intended might knock your chakra socks off. You may just want to sit for a minute… a lot. The place has a way of nurturing you, especially in your 14 foot-ceiling guest-room with the private patio opening to the grand courtyard. Pops of color at play throughout the resort reorganize into four specific guest-room palettes… mine was aubergine and I sank into its warmth immediately. I found myself peaking out from my sleep just for the pleasure of being with the space and then drifting back to dream. Drawing upon the ancient ways of landscape and design, every item that has made its way to this gracious resort is part of an instrumental silent symphony, highly vibrational and not in the audible scale. A massive slab of marble that was hand-picked from a mountainside in Italy, is now two Greek statues overlooking the 11,000-square-foot courtyard, each having the exact directional bearing as when they were pulled from the earth. Hand-made adirondack chairs in front of the resort are calibrated to create a flawless sitting experience. I didn’t want to get up. An enormous cross-section of a Sequoia tree with rings more than 2,500 years old will fill you with wonder. So what you don’t see or hear, you could easily feel. It’s all at work and play in Allegretto’s diverse co-existence of elements and all for the purpose of creating a higher dimensional category that will elevate the human experience. Your friends and family will love all the Paso Robles vineyards and the wine tasting opportunities will provide all kinds of fun. Tell them Susan sent you! This entry was posted in Venues we love to film on December 16, 2015 by videoadmin.